1. Tried the new Adriano Zumbo Tim Tams. The brownie flavour is nice, but much like the infamous macaroons, the salted caramel flavour is simply AMAZING. Try it. 2. The new Victoria Secret's store opened in Sydney's QVB building. It is smallish, especially compared to the 5 level New York City store opposite the the Empire State Building (which I literally spent two whole hours in when I was in NYC- no joke). But, WE FINALLY HAVE A VS STORE IN SYDNEY THATS NOT THE AIRPORT! I purchased a pair of cute undies and a lip plumper lip gloss (because, i just had to make a purchase, obviously). 3. 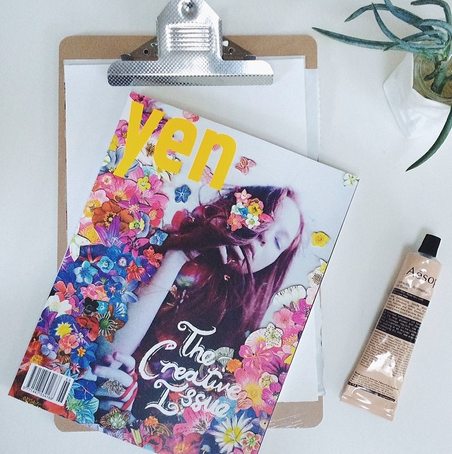 How amazing is the floral adornment on the latest issue of Yen? It's a lovely issue and totally worth handing over a $10 note for. 4. Really enjoyed the new movie, Vampire Academy. Not nearly as good as the Richelle Mead novels, and the love interest was no way hot enough, but a entertaining film nonetheless. 5. Zara has re-opened their city store and their new season collection is amaze- I am coveting one of the pastel winter coats, but our lack of freezing weather makes it, sadly, a bit hard to justify. Victoria Secrets in Sydney! Yay! love the girl tee!